We love Mac and Cheese! Here's a great recipe for one that counts as 8 Weight Watchers points. Enjoy! 2. Combine first 10 ingredients; stir well. Spoon into a shallow 2-qt baking dish coated with non-fat spray. 3. Combine breadcrumbs with margarine and paprika; stir well. Sprinkle breadcrumb mixture over the casserole. Cover and bake for 45 minutes. Uncover casserole and bake an additional 5 minutes. Yield: 6 servings. 8 points for weight watchers. One of my daughter's biggest problems when she does actually have a period is that her cramps are extremely bad. Medication is not the only route a woman can go for menstrual cramp relief. If you prefer to take the natural menstrual health approach when it comes to your cramps, then give one or all of these menstrual cramp relief tips a whirl. * Following a healthy balanced diet that is high in zinc, calcium and B vitamins, especially vitamin B6 (just don't consume more than 100mg per day) should help to relieve cramps as well as bloating. It is also a good idea to cut back on your salt, sugar and caffeine intake during the week leading up to your period. Less of these items means less severe menstrual cramps. * Heat helps, so throw a heating pad into the microwave or fill a hot water bottle and place it on your stomach or back. However, for some women, a build-up of blood in their pelvis may be the culprit behind their cramps, in which case an ice pack is actually more useful than a heat pack. The cold from the ice pack works to draw the blood out of the pelvis and towards the extremities. Try using both kinds of packs to see which is best for you. * A nice, long warm bath is another favorite among women with menstrual cramps. Throw in some soothing aromatherapy bath salts for a truly blissful experience. * If you can, avoid standing, especially if you have a sore back. Better yet, lie down and pull your knees up towards your chest. Many women find that lying in the fetal position helps to relieve the pain in their pelvis as well as any back pain they may have. * While it is likely to be the last thing on your mind, exercise really can help reduce cramps so long as your workout is gentle. Walking is an excellent, gentle activity as is swimming. Some yoga positions may also be beneficial. Additionally, working out regularly, not just when you have your period, can also work to reduce the severity of your cramps. * Some herbal teas like raspberry leaf tea and cramp bark tea have been known to relieve menstrual cramps. Speak with a trained herbalist to learn more about how to properly take these teas. * Stock up on pineapples. Fresh pineapple juice contains a lot of bromelain, an enzyme that is thought to help relax muscles and therefore help with menstrual cramps. * There are different massage, reflexology and acupressure techniques that you can do at home which will relieve menstrual cramps. Speak with a trained specialist to learn how to properly do these techniques yourself. Give any one of these natural remedies a try and see if they help! I don't know about you, but I have a very hard time finding just the right gift for some of my friend's kids. One of my close friend's daughter, Emily, is having a birthday next week, she will be 10 and she's in 5th grade. My friend said that she just loves clothes... My girls are 15 and 18! Believe it or not, kid's tastes in clothes are a lot different from 5th grade to 9th grade! lol! I've been doing some searching to find what a 10 year old girl likes to wear, while making sure it is appropriate for wearing to school! When I want to find a good deal on most anything online, I head over to shopwiki.com. You can find anything and everything over there! So whether I'm looking for Girls Clothing or Toys and Games, I know I'll find the best deals online! So, I found a couple of skirts that I think would be perfect for Emily and sent the link to my friend. She loved them! Not only am I ordering one for her, but she is ordering a couple for Emily herself! She'll be the best dressed girl in the Fifth grade! Now, for a new toddler outfit for my nephew Hunter to wear for Easter this year, I found quite a few choices. Since I only have girls, it's been fun to shop for a little boy! I can picture him now in a little suit with a bright yellow tie! It's great to know I have a place to find whatever I need online without having to do hours of searching! With the cold weather still with us, I found this great recipe for Vegetarian Chili that sounds delicious! Heat oil over medium heat in a large pot. Add garlic and onion; sauté for a minute or two, then add peppers, mushrooms, zucchini, and tofu. Sauté for a few more minutes, then add tomatoes, beans, corn, and seasoning. Stir until combined, lower heat, and simmer for 15 minutes. Top with cheese. Makes 4 servings. I found this delicious looking recipe over at Betty Crocker and I can't wait to try it! It's a Heart Smart recipe, which is great for those with PCOS. Bisquick Heart Smart® recipe! 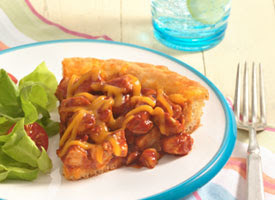 Chicken breasts make a lip-smackin’ barbecue flavored dinner bake. 1. Heat oven to 400°F. Spray 9-inch pie pan or 9-inch square baking dish with cooking spray. 2. In small bowl, stir together Bisquick® mix, water and egg. Spread in bottom of pan; sprinkle with 1 1/4 cups of the cheese. In 10-inch skillet, heat oil over medium-high heat. Cook chicken in oil, stirring occasionally, until outsides turn white; drain. Stir in barbecue sauce; heat just until hot. Spoon over batter in pan to within 1/2 inch of edge. 3. Bake 22 to 25 minutes or until edge is dark golden brown. Sprinkle with remaining 1/4 cup cheese. Bake 1 to 3 minutes longer or until cheese melts; loosen from side of pan. It's starting to feel like fall, and that always reminds me of Halloween! Here's a great recipe for a cookie made with Splenda. Not only are they delicious, they are sugar free and have extra protein in them to help keep you full longer! 2. In a large bowl, whisk together Splenda®, oats, wheat flour, soy flour, baking soda, baking powder, salt, cinnamon, and nutmeg. Stir in pumpkin, canola oil, water, egg whites, and molasses. Stir in flax seeds, if desired. Roll into 14 large balls, and flatten on a baking sheet. 3. Bake for 5 minutes in preheated oven. DO NOT OVERBAKE: the cookies will come out really dry if overbaked.